The End of the iPod As We Know It? The iPod Classic is a terrific portable media player. It may be the last of its kind from Apple. In fact, the iPod Classic may be the end of the line for the iPod as we know it. It seems remarkable that the iPod, a device just the size of a pack of cigarettes, could have so profoundly changed the fates of both Apple and music industry. And now, after millions and millions of iPods have been sold, here we are, proclaiming that the iPod is at the end of the line. At least the end of this particular line. 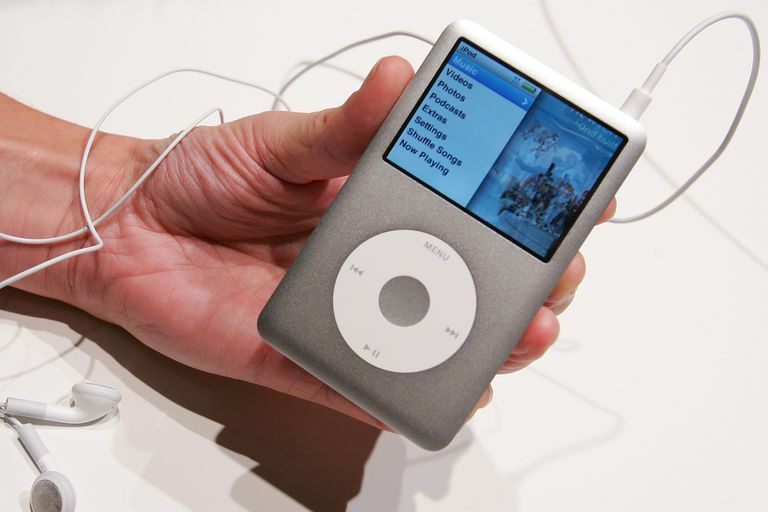 With the new, iPhones the growing appetite for video and web connectivity on the go, and the shrinking cost of solid-state flash memory, it's quite possible that the iPod won't come in the traditional iPod shape much longer. Sure, we might get a version in the same enclosure and with more memory, but it wouldn't surprise us if, for high-capacity iPods with video and Internet features, the larger screens of the iPhone and iPod touch is where the future lies. So, if this is the end of the iPod in this shape, how does the iPod Classic stack up? Short answer: Fantastically. If you've had any experience of the last few generations of iPods (the iPod Photo or Video, for instance), the iPod Classic will be immediately familiar to you. The device looks basically the same. But put it in your hand or stack it next to an old model and the differences become immediately clear. The iPod Classic is much shorter than the iPod video, even though they're roughly the same height. Though they sport similar capacities and the same size screens, the iPod Classic is noticeably lighter. These changes, of course, are welcome refinements to an already winning design. The other major changes to the device are what users see onscreen. The iPod Classic sports a revised interface that combines the iPod's traditional menus with CoverFlow to show images of album covers. It's nice eye candy, but it doesn't really make much difference to using the device. Where the split-screen interface does come in handy, though, is when you highlight a menu item to get a short preview on what's to be found if you select that item, be it the number of songs on the iPod or the amount of disk space used. The Classic also sports a full CoverFlow interface, as seen on the iPhone and iPod touch. Since the Classic lacks touchscreen features, CoverFlow here is controlled by the Clickwheel and is a bit less smooth than with touch. The graphics rendering here also tends towards the jagged, furthering the lack of smoothness. It works, but between the roughness and lack of processing power, CoverFlow on the Classic is less awe-inspiring than on the desktop or iPhone. Because it's an iPod, the Classic, of course, excels at music playback. All the features that millions of people have come love about the iPod are present here and continue to make the iPod the best portable music player available. The transfer of content from the desktop to the iPod seems speeded up in this version of the device: we synced about 500 songs, one feature film, one short film, a TV show, and our contact list to the device in roughly 5 minutes. Anecdotally, that seems much faster than with previous iPods, even though the devices use the same USB connections. The addition of video playback was one of the major evolutionary jumps in the development of the iPod in recent years, but the smallish, square screen on these models never really displayed video in a compelling way. It took the widescreen displays on the iPhone and iPod touch to do that. The iPod Classic is no different when it comes to video. Videos formatted for a square screen look great, albeit a bit small. When you try to watch widescreen content, though, you're forced to choose either between a small, narrow image or cutting the edges off the picture. Accessories offer you the ability to broadcast video from the iPod to a TV, though. As with recent iPods, the Classic offers an array of bonus features that aren't quite central to the iPod's mission, but makes the device nicer all the same, including support for syncing calendars and contacts, pre-loaded and downloadable games, photo storage and display, and support for the copious amount of downloadable content at the iTunes Store. When the traditional iPod was the only game in town, it was neat to have these features. Now that there are bigger-screened, more full-featured devices like the iPhone, though, trying to use the Classic in that way makes less sense. For users most interested in using their portable media players as calendars and productivity tools, the iPhone or iPod touch, with robust calendars, email programs, and address books—as well as onscreen keyboards and Internet connectivity—make more sense. Since it seems as though those features, especially Internet connectivity, are increasingly becoming the things users look for out of their devices, the writing does seem to be on the wall for the old-style iPod. Perhaps the most major improvement I noticed in the iPod Classic over the iPod Video (our main iPod for the past few years) is in the area of battery life. The battery life offered by the iPod Classic approaches remarkable. We kept the iPod on standby for nearly a week and drained almost no battery at all. In trying to drain the iPod's battery completely, we were able to squeeze nearly 24 straight hours of music playback before the battery cried for mercy. This lines up pleasingly well with Apple's rating for the Classic's battery. Though this isn't a functionality improvement, whatever Apple's done to improve the battery life so dramatically on the Classic will keep its owners happy for many, many, many hours. With the iPod Classic offering so many of the traditionally excellent features of the iPod line and a few strong improvements, it may seem hard to believe that this could be the last iPod of its kind. But that seems almost inevitable. After all, where can this kind of iPod go from here? More capacity and battery life, no doubt, but as soon as you begin to add Internet connectivity or a more robust platform for programs, you cease having a traditional iPod and venture into the iPhone/iPod touch territory. That's OK. This version of the iPod has served many people well for many years—and changed many things about the world as it did so. Here's hoping that as Apple moves its efforts more squarely towards devices with larger screens, connectivity, and third-party programs it creates as refined and appealing devices as it's done with the iPod Classic. Apple discontinued the iPod Classic in Sept. 2014. What Is the Best Current iPod? What Do You Know About the History of the iPod? What Are Some Great, Durable Cases for the iPod Classic? Is the 4th Generation Apple iPod Touch a Worthwhile Purchase? Is the iPod Touch the Best Handheld Device Ever?